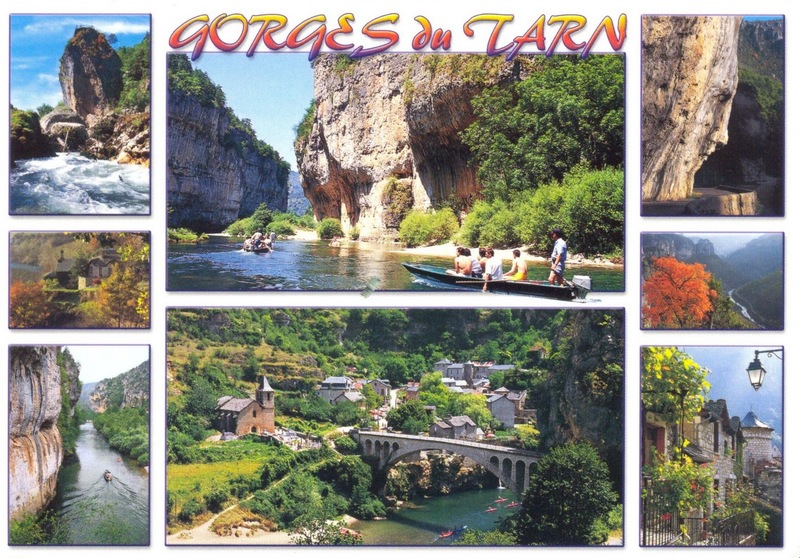 Daniel sent me this colourful postcard showing The Gorges du Tarn, a touristic canyon formed by the Tarn River between the Causse Méjean and the Causse de Sauveterre, in southern France. The canyon, mainly located in the Lozère department, and partially in the Aveyron department, is about 53 km long. Daniel affixed a beautiful stamp issued on May 5, 2011 about Reims Cathedral, a cathedral of the thirteenth century. Major achievement of Gothic art in France, it is a World Heritage Site by UNESCO since 1991. In spring 2011, the cathedral will celebrate its 800th anniversary. As such, La Poste issued a block of two round-shaped stamps showcasing the colourful and beautiful stained glasses of the Cathedral. 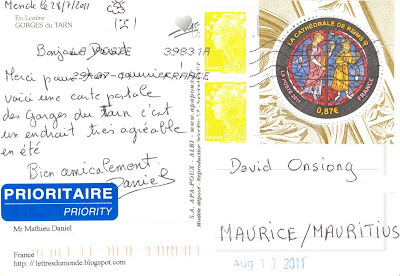 The 2 other stamps on this card are Beaujeard's Marianne definitive.